I really don't know what's more delicious than this. 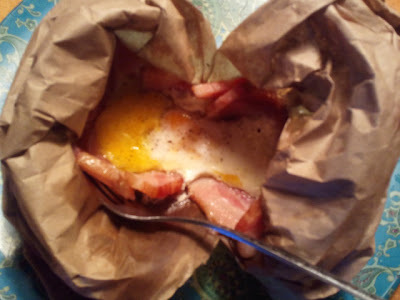 Am I the only one who looks at this photo of an egg cooked in a bed of bacon in a paper bag and thinks it is possibly the most delicious-looking thing in the world? In fact, I think the photo above is a tad blurry because my hands were shaking in anticipation of eating my creation, and having to fight the children off at the same time. Back! Back! Mmm. Paper Bag Eggs. My non-camping friends may think it odd that I obsess over ways to cook an egg without a pan, but don't they know that one could be stuck in the wilderness at any moment with nothing but a dozen perfectly unscathed eggs and a paper bag? It could happen! Another benefit of the Paper Bag Egg is that, whilst cooking, it can burst into flames at any moment and children really enjoy this. From The Real Family Camping Cookbook. 1. Cut both bacon strips in half, giving you 4 pieces. 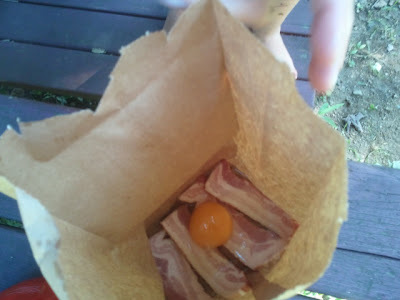 Line the bottom of the paper lunch bag with the bacon to make a nice, fatty bacon nest for the egg. 2. Crack an egg into the nest. 4. Carefully hold the bag over the fire so the bacon cooks slowly and the fat melts. This makes an oily paper and bacon “skillet” for the egg. Take care and keep cooking it until the egg is done. 5. Eat it out of the bag … but put it on a plate! If you put it on your knee it will ruin your pants. I learned this the hard way. 6. Serve with salt & pepper, catsup & hot sauce. But it really doesn't need anything at all, it's that delicious. Bon appétit my friends, and have fun! Oh, my God! I never try it. But looks fabulous. It is so good, elena. And if the fire is low enough, you can put the bag right on the grill! This is great for people like me who are too lazy to hold a stick. Yummers! Ooooh, I can't wait to share this with my kids. hope the bag doesn't catch fire. or maybe i do :) We WERE supposed to go camping last week, and wouldn't you know it, its a drought and the day we picked is the only day its rained in weeks. Gonna try again this weekend. Wish us luck!!! Nicki Woo! Can't wait to hear about your adventure. I have cooked a Turkey in the oven at home in a paper bag that was all buttered up but this is the best dishwashing secret yet. No pan, just burn it. We have put a hash brown or two on the bacon, before the egg and it is YUMMY!!!! wow..great idea! i love camping but i'm very new to it. thanks for the idea. we will have to try this. My first thought was that I wouldn't have to do any dishes while camping if we made this. Yesssss. We went camping for the 4th of July holiday at the Elk Neck State Park in North East, MD. This recipe was on the menu but my husband was not a believer. He was convinced the whole thing would go up in flames. Luckily for us he was wrong. The entire idea was a success. We added two eggs to the bags instead of one--I had four hungry teenagers to feed.Also we placed the bags on a grill grate instead of using the sticks. This recipe is a keeper and will become a tradition on our yearly camping trips. What's the bacon like if you do this? Does it get crispy at all? 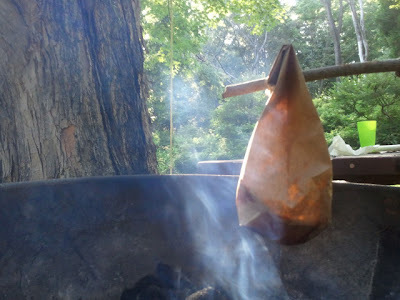 Used lots of cooking methods in the wilds and used paper bags for many things, but this has to be one of the most tasty, especially with shredded tater. I guess i just don't get how the bacon actually cooks enough before the bag either breaks from moisture, or burns up. It seems to me the bacon would still be quite raw. The bacon does cook - the fat renders off and the eggs cook in the bacon fat. Mmm .. arteries beware. The bag has never broken on us, although sometimes we hold it too close to the fire and it burns up! how long you cook it for? This is awesome, can't wait to try it this summer! i do the same with my eggs and sausage. but i use a plastic bag you can close, in a pot of boiling water on top of my little camping burner. its quick cooking and deliciouse, and simple clean up. This is a fantastic idea. Can't wait to go camping. You can cook the eggs as long as you like - it just takes a little patience - and don't let the bag catch on fire! The eggs in the photo were actually set pretty solid. So we're talking fatty PORK bacon, right? It can't be turkey bacon? Tiffinye we use pork bacon - it has to be good and fatty so when you're cooking it the fat melts and keeps the bag from catching on fire! You might be able to use turkey bacon if you put a big pat of butter in the bottom, worth a try. How long do you cook it for? We don't usually have paper lunch bags lying around so I'm thinking we can use tin foil and set it on the grill. Still prevents clean up and I'm sure it'll cook everything the same (if not better than) a paper bag. Anyone tried that? We can use paper bags or shopping baskets. 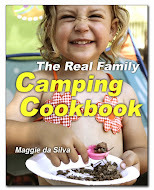 OUR CLASSIC CAMPING RECIPES ... AND MORE!